For medical device manufacturers, biostability is an important aspect of medical component design and manufacturing. Any item that comes into direct and prolonged contact with body tissue, corrosive body fluids, electrolytes, proteins, enzymes, or lipids must be intrinsically biostable. If it is not, the surface must be protected in a manner that does not compromise therapeutic efficacy. In some instances, such isolation can be provided by an overlying coating. Powdered dimer (di-paraxylylene) is placed in a vacuum deposition system to create a monomer gas. Various medical coating options are available, each with its own set of properties and characteristics. Parylene, however, offers properties that can be especially advantageous for some coating applications. This article reviews the primary issues in medical coating, summarizing the basics of the parylene coating process and describing its advantages and limitations as an aid to coating selection. Biocompatibility. Coatings need to exhibit long-term compatibility and a nonreactive relationship with body fluids and tissues. The coating should not undergo any chemical interaction with the substrate to which it is being applied, nor should it produce any toxic by-products or extracts that could be harmful to a patient or to the function of the item being coated. Coating Inertness. The product's coating must not contaminate the substrate with outgassing or with by-products from catalysts, cure agents, solvents, or plasticizers. Hydrophobic Characteristics. Hydrophobic—or hydrophilic—characteristics may be important in certain medical applications—for example, a hydrophilic cardiovascular catheter (slippery when wet) for ease of insertion versus a wet hydrophobic guidewire that would be easy for the cardiologist to grip. Cure Temperature. The cure temperature of a coating must be within the performance range of the substrate. Cure Forces. A coating's cure forces must not degrade or distort the underlying substrate. Conformability. The coating must offer conformability to highly variable surface geometries. It must provide effective isolation of all surfaces, including hidden areas, crevices, etc., without bridging or pooling. The coating must be able to maintain conformability at all magnitudes of substrate and surface feature sizes, from macro to micro. Finished Thickness. The finished thickness of a coating is important. The coating may need to meet extremely tight dimensional tolerances, and therefore be quite thin, while at the same time be able to provide uncompromised physical, chemical, or electrical protection for the substrate with coverage that is free of voids and pinholes. Mechanical Loading. A coating often needs to function dependably without significantly altering the physical or mechanical properties of the substrate. Resistance to Flaking. A coating needs to have considerable flaking resistance. It must be sufficiently robust and adherent to prevent flaking from substrates or from itself. Sterilizability. A coating must be capable of withstanding the effects of one or more sterilization processes. FDA specifies three contact-duration categories for medical devices: limited contact for a contact duration up to 24 hours; prolonged contact for a duration of 24 hours to 30 days; and permanent contact for any contact duration lasting longer than 30 days. Biomedical coating applications can be generalized into two primary categories: short term—disposable or single-patient-use items—and long term—prosthetic hardware, reusable lab equipment, or various implants. The primary coating requirement for short-term applications is surface isolation. This can be accomplished with a coating that creates a benign barrier between a substrate and body tissues. A short-term coating application may also require one or more secondary properties, however, such as lubricity or dielectric protection. Long-term medical applications often demand the same coating performance, with the added necessity of functioning as intended for an extended period. There are other coating requirements, such as tissue growth promotion, that are unique to long-term applications. Medical Seals. With medical seals, a coating may be used to eliminate tackiness, to supplement mechanical strength, and to provide dry-film lubricity and chemical isolation. Pressure Sensors and Transducers. Sensor coating entails the protection of delicate, sensitive elements without mechanically loading transducing surfaces or otherwise interfering with device function. Guidewires. The principal coating function for guidewires is to promote ease of insertion and to protect wires from potentially corrosive biofluids. Catheters. Coating increases lubricity and isolates surfaces from corrosive biofluids. Mandrels. An appropriate coating reduces the coefficient of friction, ensures a particulate-free surface, eliminates microscopic flaking, and extends the useful life of mandrels for the production of elastomer parts. Brain Probes. Brain probes benefit from the increased lubricity of a coating, and may require selective insulation to suit their conductive function. Needles. An effective coating should seal micro-porosity, minimize injection trauma with enhanced lubricity, and cover both inside and outside needle surfaces without measurably changing dimensions. Electronic Circuits. A coating should isolate the surface from moisture and corrosive biological effects, and electrically insulate conductive elements. Cardiac-Assist Devices. Implanted cardiac-assist devices need to be isolated from corrosive biofluids, and electrically insulated by a conformal coating. Pipette and Microplate Trays and Covers. A coating should seal surfaces to eliminate microporosity; isolate surfaces from corrosive biofluids, moisture, and chemicals; and lubricate the product's cover attachment. Parylene is a thin, vacuum-deposited polymer. It differs from conventional coatings in that it is deposited on objects at room temperature as a film, and does not use solvents, catalysts, plasticizers, or other feature-enhancing additives. It is based on a high-purity raw material called di-paraxylylene, which is a white, crystalline powder. A vacuum and thermal process converts the powder to a polymer film, which is formed on substrates at room temperature. Parylene's unique properties include precise conformance to substrate topography, pinhole-free coverage in very thin layers, and the ability to penetrate and coat complex surfaces. Parylene film resists chemical attack from organic solvents, inorganic reagents, and acids; it adheres well to many surfaces, and offers dielectric strength above 5000 V dc at 1 mil of film thickness. It has a lubricious surface, with a coefficient of friction in the range of 0.25 to 0.33 (per ASTM D1894), which approaches that of PTFE (Teflon). Paraxylylene coatings are applied to substrates in an evacuated deposition chamber through vapor-phase deposition (Figure 1). This involves the spontaneous polymerization of a vapor formed by heating the dry, powdered raw material. At room temperature, the resulting vapor converts to an inert film on surfaces in a dry, solventless, and catalyst-free process. Figure 1. The vacuum deposition process converts powdered raw material to a monomer gas and then to a polymer film. A number of characteristics make parylene coatings particularly attractive for medical applications. Parylene's crystal-clear film has very low thrombogenic properties and low potential for triggering an immune response. The film has also been shown to be highly resistant to the potentially damaging effects of corrosive body fluids, electrolytes, proteins, enzymes, and lipids.1 In addition, the film also forms an effective barrier against the passage of contaminants from a coated substrate to the body or the surrounding environment. Because properly formulated parylene raw material is pure, no foreign substances are introduced that could degrade medical surfaces. Parylene is not a liquid at any stage in its application process, and thus it does not exhibit the surface-tension effects of pooling, bridging, or meniscus. There are three versions of parylene currently available for medical surface-modification applications. The first two, parylene N and parylene C, are the most commonly used for medical products (see Table I). Table 1. Comparability of the properties of parylene N and parylene C.
Parylene N. Parylene N provides particularly high dielectric strength and a dielectric constant that is independent of frequency. Because of its high molecular activity during deposition, parylene N has the highest penetrating power and is able to coat relatively deep recesses and blind holes. Its low dissipation factor and dielectric constant suit high-frequency substrates where the coating is in an electromagnetic field. Parylene C. Parylene C has a chlorine atom added onto the parylene N benzene ring, and this gives it an excellent combination of electrical and physical properties, including a very low permeability to moisture and corrosive gases. Parylene C deposition is substantially faster than parylene N, and therefore its crevice-penetrating ability is reduced compared to the more active parylene N molecule. Parylene D. With two chlorine atoms added to the benzene ring, parylene D has a higher degree of thermal stability than parylene C or parylene N, but its crevice penetration ability is the least pronounced of the three versions. Parylene can be coated on such diverse substrates as glass, metal, paper, resin, plastics, ceramic, ferrite, and silicon, and even on powdered and granular substances. The coating achieves conformal coverage, moisture protection, dielectric protection, and freedom from pinholes in layers as thin as 500 Å.
Parylene has been evaluated in blood compatibility tests and found to be significantly superior to alternate materials such as poly(hydroxyethyl methacrylate) and various fluorinated polymers.3 Parylene also has low toxicological properties. In addition, a 25-mm-thick coating of parylene on silicone-coated devices reduces water absorption to a virtually un-detectable level. Proper substrate preparation is critical to successful parylene coating. Cleaning must remove all oils and contaminants to ensure adhesion. Furthermore, it may be necessary to promote adhesion with the use of a silane pretreatment. The latest parylene coating systems incorporate in-chamber silane promotion for process efficiency. The parylene coating process begins with the sublimation of the raw material, di-paraxylylene—a white, crystalline powder—at approximately 150°C. This process takes place in a preliminary process zone. The vapor resulting from this preliminary heating is then molecularly cleaved, or pyrolyzed, in a second zone at 680°C to form paraxylylene, a highly reactive monomer gas. 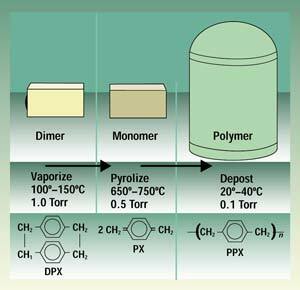 The monomer gas is placed in the deposition chamber, where it polymerizes onto substrates at room temperature and forms a transparent film. The pressure gradient across the three zones (from 1.0 to 0.5 to 0.1 Torr) drives the parylene deposition process. In the deposition stage, parylene polymerizes spontaneously onto the surface of objects being coated, with no cure-related hydraulic or liquid surface-tension forces, either initially or subsequently. The coating grows as a conformal film (polypara-xylylene) on all exposed substrate surfaces, edges, and in crevices, at a predictable rate. There is no liquid phase, and substrate temperature remains near ambient. Parylene's chemical structure—particularly its high molecular weight, crystallinity, and all-carbon backbone—is of significance to medical applications. The absence of polar entities in the essential makeup of all three of the parylenes makes them hydrophobic, stable, and resistant to chemical attack. In contrast, other polymeric coating systems may have oxygen, nitrogen, or sulfur atom links in their backbone structures, and thus may require cross-linking to achieve desired properties. This makes them more vulnerable to solvents and chemical degradation. Others may contain solvents, fillers, stabilizers, plasticizers, or other potentially mobile additives that might outgas or be leached out during use. There are no specific FDA regulations pertaining to the biological compatibility of any parylene polymer or precursor. Device and drug master files for such materials have been established with FDA, however, and these contain valuable information. The files are intended to assist FDA in determining the safety of parylene for any specific application. Test requirements for materials including parylene—such as ISO 10993-1 and FDA's bluebook memorandum G95-1—provide guidance that serves as a basis for device manufacturers to choose among material candidates and biological evaluation strategies. Parylene is best suited to relatively demanding medical coating applications that cannot be easily satisfied with less sophisticated materials. Material and processing costs associated with this material may discourage its use in less-demanding applications; however, vacuum deposition coating offers performance characteristics that are not available with conventional sprayed, brushed, or dipped liquid coatings, and parylene may be appropriate when an application requires a combination of biocompatibility, coating effectiveness in extremely thin layers, high dielectric strength, pinhole-free coverage, and superior chemical resistance. Parylene accomplishes multiple surface-modification functions and is widely used in medical device manufacturing for several reasons. Since the film is formed from a molecular state, it continues to be appropriate as medical components are reduced in size and increase in complexity. The extreme inertness and purity of the end product makes parylene a logical choice for both functional and safety considerations. Research continues on parylene processes and materials with the goal of further reducing cost while maintaining high performance. A company may install and operate its own parylene coating equipment in-house, depending on production volume, available technical resources, and manufacturing space. In other cases, outsourcing to an experienced parylene supplier, knowledgeable in FDA requirements, may be a more cost-effective choice. Users should seek a parylene supplier that has demonstrated expertise in the specialized requirements of medical coating, with sufficient resources to provide services such as raw material testing, quality assurance, traceability, process validation, regional services, and adequate technical resources for process development. Medical manufacturers may find that a qualified, experienced parylene medical coating supplier is a helpful resource when qualifying coated products with FDA. 1. AW Hahn et al., "Biocompatibility of Glow-Discharge-Polymerized Films and Vacuum-Deposited Parylene," Journal of Applied Polymer Science: Applied Polymer Symposium 38 (1984): 55. 2. WE Burkel and RH Kahn, "Cell-Lined Nonwoven Microfiber Scaffolds as a Blood Interface," Annals of New York Academy of Sciences. 3. FG Yamagishi, "Investigation of Plasma-Polymerized Films as Primers for Parylene-C Coatings on Neural Prosthesis Materials," Thin Solid Films 202 (1991): 39–50. Lonny Wolgemuth is medical product manager at Specialty Coating Systems (Indianapolis), a Cookson Electronics Company. He has more than 20 years of experience in the medical device industry in product and marketing management.